But if you’d like to give it an encouraging pat on its pad, be careful. Though missing the long, sharp spines associated with cacti, all prickly pear — even the so-called “spineless” — are covered with nearly invisible glochids. Less obvious than larger spines, they can be even more painful to experience, and far more difficult to remove. I never heard of a glochid before — like a splinter, sort of? Only certain cacti have them, and the prickly pears have them in abundance. Here’s a photo that shows some spines and some glochids. The spines are about an inch long, so you can see how tiny the glochids are. They’re much worse than a splinter, because they have tiny barbs on the end. Once they come to visit, they want to stay. When they get glochids in their tail. I didn’t know about glochids, sounds a bit like stinging nettles, but worse. I’ve been thinking about this. I’d say stinging nettles are worse, or at least, more painful initially. The bull nettles certainly are more painful. Spines, glochids, or nettles, are all painful, but I think the worst thing is being on tenterhooks. Now, that brought a grin. I also realized that despite years of hearing and using the phrase, I had no idea of its origin. This article took care of that. What’s interesting is that marine canvas has to be stretched to prevent shrinkage when drying, too. If a hatch cover or bimini is allowed to dry off its frame, it almost always has to be wet again, and then stretched to fit whatever it’s supposed to cover. No hooks are used, though. Such a great shot! And good advice on touching these things: those glochid splinters–I’ve certainly been the recipient of their gifts! Where’s the duct tape?! I learned another way to remove glochids when I first met fiberglass in a boatyard. I was surprised to see workers rubbing nylon stockings on their skin, but it does a good job of pulling out the glass fibers. I figured it ought to work with glochids, too, and it does. Nothing’s perfect, but it’s not nearly as painful as pulling off duct tape — and when you’ve run into glochids and spines, who needs more pain? Dr. Seuss would have appreciated this plant ….from a distance! I know about those glochids~yikes. I love the thought of Dr. Seuss riffing on a sentient cactus, Melissa. He’d be the perfect one to do it. As for the glochids — he could turn them into some truly despicable characters for his story. The Oxford Dictionaries just taught me or reminded me that the word is from Greek glōkhis, glōkhid- ‘arrowhead’. Their size is inversely proportional to their persistent nuisance. And that accords perfectly with something else I’ve learned about glochids: that they have a barb on the end that helps to make them hard to remove. They’re actually constructed differently from the spines, and act more like an arrowhead. It’s a structure I’ve reconfirmed all too often. It can be a memorable experience, that’s for sure. What a cool shot! Almost looks like Mother Nature sensed that we all need to be reminded that she cares about us, despite this ongoing winter. Will these two “branches” become flowers eventually? No, those branch-like things are new pads forming. As they age, the little spikes on them (which actually are leaves) will fall off. The pads function as stems, and the blooms will form along the edges of them. They are the coolest plants in the world. I brought back a cluster of three pads from the hill country years and years ago, and have given away more than I can remember. I still have too many on my balcony: including one that’s so large I hardly can move it. All you have to do to propagate them is break off a pad and stick it in the dirt. I do have a soft spot for these, and for the so-called “cow’s tongue” that I’ve seen around the hill country. There’s a yard near the grade school in Kemah that has one at least eight feet tall. I think some rotted away after the flood: or perhaps they just cut it back. It was getting a little unwieldy. Lovely shot, Linda! Looks like two palm trees on either side of the gateway to Spring! I don’t know if I have seen a Spineless Prickly Pear cactus before. Spineless are more prickly and difficult, aren’t they?! They do look a bit like palm trees, don’t they? A gateway to Spring sounds delightful — around here, Spring’s made her way through that gate, and is taking over the countryside. I read that the spineless prickly pear were developed in this country by Luther Burbank; between 1907 and 1925, he introduced more that 60 varieties. I’ve seen one cultivar that has beautiful, rosy pink and green pads. I’d love to find one of those, although I’m not sure where I’d put it. A very nice and informative link which has you smiling with the cautionary tale while never wanting to get anywhere near those things. And they look kind of white and fluffy and soft backlit from a distance. Looks can be deceiving! I went hiking/climbing on some hills in the Philippines we called the Palisades back in 1970 (snuck out the back gate of Clark Field). They looked like soft velvet green from the distance but the reality was anything but. That climb featured one of my life’s scariest moments. Oh are your prickly pears the kind they make margaritas out of? My favourite margarita locally is a Prickly Pear Margarita. They soak them in Tequila until the alcohol is infused with a lovely peachy color..and they are yum. It’s a fact that some of the cacti I’ve found out in the country do have the appearance of being fluffy and soft, especially the lace cacti. I don’t know what it is that makes me want to touch them, even though I know better. I have a tall, columnar cactus that’s been around for several years and that needs repotting. The best advice I’ve read seems to be buying a pair of good but inexpensive gardening gloves, and then throwing them away immediately. When you mentioned your climb, I thought about the yucca and prickly pear I saw on the sides of some cliffs last week. Dealing with fields filled with prickly pear is one thing, but taking a tumble in the midst of those would be horrendous. Every recipe calls for prickly pear syrup, but none mentioned the process required to make that syrup. It’s no doubt akin to the process of making prickly pear jelly, and that’s not for the faint-hearted. 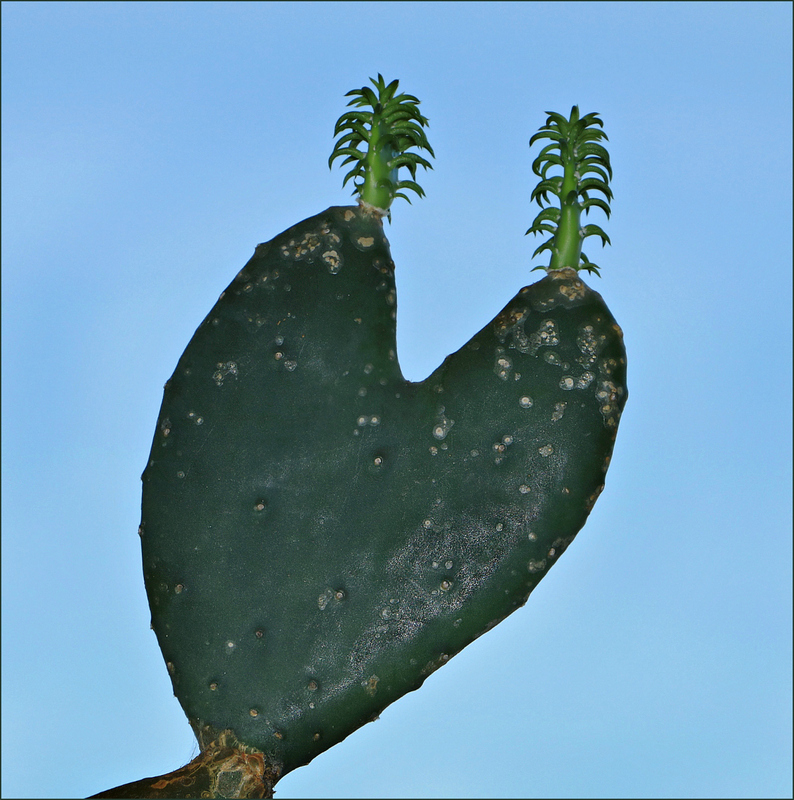 Nice shot of the spineless cacti, looks like a heart. My mother had a large specimen of the spineless variety. It bloomed nicely each year. I’ve met a few thorns in my lifetime- mesquite and cactus. It was that heart shape that attracted me to this one. I think the large ones are so attractive, and of course the blooms are beautiful. It is surprising how many of our plants are thorny: vines, flowers, and trees, as well as cactus. I spotted a bull nettle last week in time to avoid it, but had an unfortunate encounter with greenbrier. You have to hand it to the plants — they know how to protect themselves! First, I love that image! that new growth looks like two itty bitty palm trees springing to life on twin islands! I’m not sure what type of little ‘espinas’ the pittahaya have, but they are tiny and are very difficult to remove.. if not removed, my skin often does a pretty good job of making little blisters to coax the little barbs out in a day or so. it’s not pretty, however! Thanks for that fun botany lesson and for the extra trivia – and chuckles – via the comment section! I vaguely remember the pitahaya, and probably from your blog. I don’t think I’ve ever seen the fruit, but it seems as though the preparation would be almost identical to working with the prickly pear tunas. When I first read an article about harvesting tunas, I was impressed by the numerous cautions, and by the suggestion that the best way to pick them is with tongs. I thought of you a week or so ago in a different context. I happened upon white wisteria on the grounds of a Buddhist temple (more about that later) and remembered the only other time I’ve seen white wisteria: in Mississippi, near the River and the Doro Plantation. I have to laugh when I remember the other flower that was abundant there. It was pretty, purple, and I didn’t have a clue what it was. Now, I know that it was that wonderful Mississippi “exotic” — spiderwort! Buenos dias! What a great and lovely narrative as I reconcile my dream world with the waking one! This morning is my last ‘day’ in the little apt in the cloud forest; (I’ve been repainting walls after spackling all of those nail holes!) I’ll soon join the Semanta Santa travellers on that 7- hour drive to the coast. There’s a painting in progress awaiting my return,, and I look forward to finishing it soon. The pitahaya is also called Dragon Fruit, and it doesn’t have that happy posture of your prickly pears. It is leggy and sprawls, so is usually grown on some type of trellis or support. White Wisteria and Purple Spiderwort! Sounds like the title to an essay or the name of a painting! Down here, the ‘Yucaraton’ is still in bloom; after that first cascade of flowers, the trees wrapped themselves in leaves and continue to cast sprays of flowers… not in the dramatic display, but with the continued rains, the flowers also continue. Lovely to witness! Will be heading home soon, so back to silent mode! It’s about to fool around and get spring on us up here in the flatlands, too. We could do with about a month of intermittent 1-inch rains. We are so dry up here. I need to get my front flower bed forked, weeded, and get my wild flower seeds planted! I wondered how things are progressing up there when I drove through Danevang on Sunday and saw the cotton fields prepared and, in some cases, planted. Last year I missed the cotton plant bloom. Maybe this year I’ll time it right. Everyone’s got their fingers crossed for rain. I hope you get some — I see there are some chances — and that those wildflowers do well for you. We could use the inch or three they’re predicting, too, and if it comes, the wildflowers certainly will profit. The mere mention of prickly pear in Australia would be greeted with a lot of apprehension. In the 1920 the invasion of that plant made millions of acres unfit for farming. It is high on the list of forbidden and noxious plants. The above photo shows that beauty doesn’t care for that. As for the removal of its tiny glochids. Our daughter had the tiny needles removed by the application of strong hospital grade sticky plaster onto the affected area and then quickly pulled off. It did the trick in a split second and pulled out all the tiny needles. That’s a wonderful article you linked to, Gerard. For one thing, it has a better description of the cacti than most articles I’ve found, and the list of species is helpful. I smiled at the one called “bunny ears.” I recognized it when I looked at some photos; it’s one I’d enjoy having around, even if it isn’t so smooth and silky. Those before and after photos of the land are impressive, too. Somewhere I have a photo of the cochineal insect that was used to tackle the invasion. It’s amusing that most articles about the insect here are slanted toward cactus growers who want to get rid of the insect, not the plant. Clearly, to know them is to despise them. It sounds as though you have a little first-hand experience, Curt — not surprising, given some of the territory you’ve traveled. Only once, Linda. After that I was much wiser. It’s like you need a magnifying glass to go after them! No need to post a warning for me. I got them (somehow) through my clothes on my midriff area and apart for the constant pain and irritation, they are sooooooo difficult to remove. That’ll teach me to lean over one to photograph them up close. That hurts even to read about. They are sneaky, no doubt about that, and if they can’t find skin, they’re more than happy to attach to clothing, too. Your encounter reminds me of my first encounter with bull nettles: I squatted down to photograph a white prickly poppy, and sat on one. It was inexperience more than stupidity, since I didn’t recognize the plant at the time, but it certainly was memorable. I remember the glochids and not fondly either. There is a species in the Sonoran Desert in Arizona called Beavertail that has them in clumps and they are nasty! Beautiful flowers though. It’s interesting how many of the prickly pear names are related to other animals: beavertail, bunny ears, and so on. It reminded me that I’ve seen the cow’s tongue cactus in the hill country, and when I looked online to see how common it might be, I discovered one (one!) pad for sale on Amazon for $48. It reminded me of the lichen market we talked about in the past. One person’s ordinary plant is another’s exotic, I suppose. The beavertail is pretty. There was a US postage stamp that featured it; I found it in my dad’s collection when I was sorting through it a couple of years ago. I will admire from a very long and safe distance. An excellent response to the question. I was interested in the article on the prickly pear invasion in Australia and how difficult it was to control it. I just looked at a list of New Zealand invasives, and was surprised to see how many invasive plants we share. One I remember is the Japanese honeysuckle, which I saw blooming today for the first time this spring. Purple loosestrife was another. Ah, yes, purple loosestrife. I don’t see that much but Japanese honeysuckle is about in the neighbourhood. I saw the heart first, but it took some creative people like you to see the palm trees. Now that you’ve pointed them out, I can see them. Do you suppose someone said something like that on the first Easter? “Well, now that you’ve pointed him out…” Happy Easter!